Understanding The Difference Between MIG and TIG Welding – What’s Right For Your Boat? If you’re not a welder yourself, the world of marine welding can be quite confusing. There are so many specialized terms that it’s hard to understand what, exactly, you’re paying for when you hire a marine welding company in Fort Lauderdale. In this guide, K&G Marine will break down one of the most frequently-asked questions. What’s the difference between MIG and TIG welding, and which one is right for my boat? Let’s get started now. TIG stands for Tungsten Inert Gas. This method of welding uses a non-consumable electrode, made of tungsten, to run a high-powered current through the metals being joined, and bond them permanently. One of the main differences between TIG and MIG welding is that TIG welding does not always use a “filler metal” – a wire that is melted to help join two objects together. MIG welding always uses some kind of filler, while most TIG welding projects do not. This means that TIG welding usually requires a hotter operating temperature to work correctly, as both pieces of metal must be welded at extremely hot temperatures. TIG welding is usually a better choice for joining thinner, more delicate pieces of metal. Thin metal is much easier to weld without a filler, and TIG welding will provide a more seamless, beautiful result. TIG welding also provides a stronger overall bond than MIG welding, because it physically bonds both pieces of metal to one another without the addition of a large volume of filler material. MIG stands for Metal Inert Gas. All MIG welders utilize a metal wire, which is used as a filler material to help bond metal objects. As the MIG welder operates, this wire is continuously melted, and bonds to each object that is being welded together. This makes MIG welding a much better choice for thick pieces of steel. Thicker metals cannot be heated up quickly enough by TIG welding, so they require some kind of filler material in order to be joined properly. For heavy-duty marine welding, MIG welding is usually recommended, due to its ability to join thick metals very quickly. However, MIG welding is often not quite as seamless and attractive as TIG welding, making it a poor choice in areas where aesthetic perfection is desired. Still Not Sure What’s Right For Your Boat? Let Us Help! At K&G Marine, we offer the best marine welding in Fort Lauderdale. We can help you choose the method of welding that’s right for your boat. 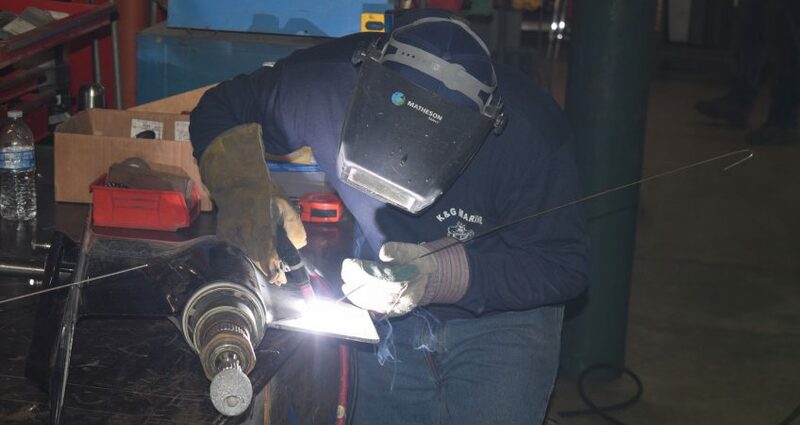 No project is too big – or too small – for our welders! Contact us now to learn more about the different methods of marine welding. We would be happy to discuss your project, and which method of welding is right for you.